"IF IT'S NOT IN THE BOOK, IT'S NOT HAPPENING"
and told us all how fabulous she was at organising. As she thumped that book, we believed her! People wanting to know how The Book worked but Tanya kept her mouth shut and didn't share. I'm dead proud when a mate of mine launches something that I believe in and Tanya's done just that. She's taken her Book idea and gone public and called it Dotty Diary! The system is so simple yet I know it works well as I've been using a similar diary/notebook idea at work for the last seven years with my BOAT (Book Of All Things). Tanya sent me the full system (A4-sized super quality 2013 diary, instructions, pen, highlighter - all wrapped up in a protective plastic folder) and I'm going to use this at work as my desk diary instead of my BOAT. That's how much I believe this works! Obviously I cannot share Tanya's Dotty Diary secret here - you'll have to invest in the system for that - but once you have the tools for the job, you'll be able to replicate it on many levels. 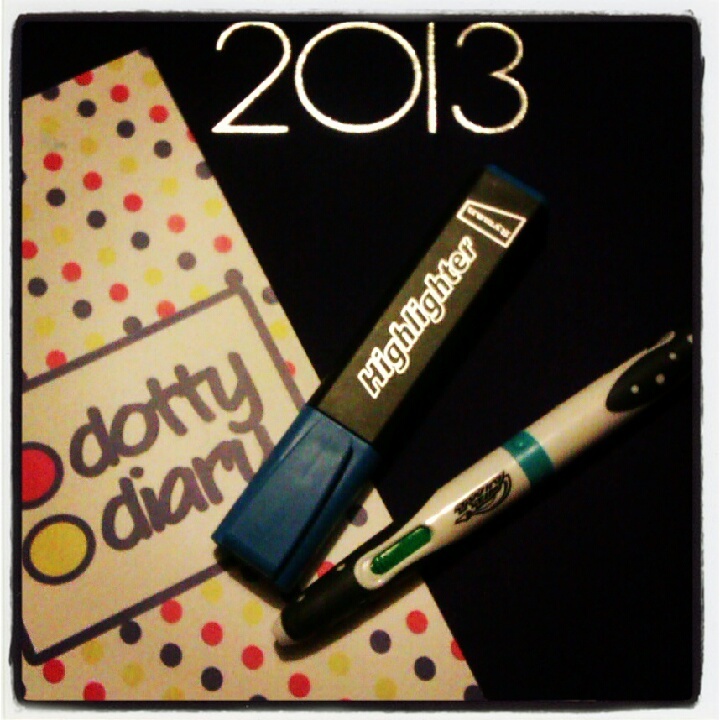 The 2013 pack has been produced on a speedy scale so that Dotty Diaries can be sent out ready for the new year but from 2014 onwards, the Dotty Diary pack will be even more unique. My Top Tip for this system is to keep using the plastic folder that the diary and accessories arrive in. That way you'll never lose your pen and highlighter! And to know what that means, you'll just have to buy one, won't you? More details and prices on the Dotty Diary website.